The Eurozone does not provide a union-wide safe asset. In its absence, financial stress triggers cross-border capital flights to safety, which create distortions (Lane 2013). During sovereign debt crises, a diabolic loop sets in whereby banks holding risky sovereign debt suffer losses to their net worth, causing them to cut back on their lending to the real economy and increasing governments’ contingent liabilities (Farhi and Tirole 2016, Brunnermeier et al. 2016a). The policy challenge is to create a union-wide safe asset without joint liability among sovereigns. Brunnermeier et al. (2011) propose a design for such an asset, named ‘European safe bonds’, or ESBies. 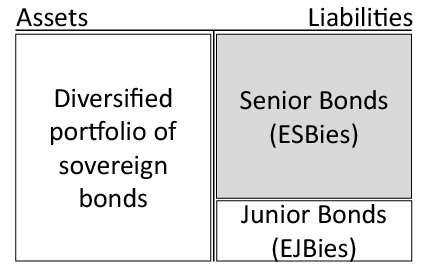 ESBies are the senior tranche of a diversified portfolio of Eurozone sovereign bonds (see Figure 1). Sovereigns remain responsible for their own bonds, which would still be traded at a market price, exerting discipline on borrowing decisions. A sovereign could default on its own obligations without others bearing any bail-out responsibility and without holders of ESBies bearing any losses. Source: Brunnermeier et al. (2011). In a new paper, we investigate why and how ESBies would contribute to the stability of the Eurozone (Brunnermeier et al. 2016b). First, we carry out numerical simulations to gauge the safety of ESBies. Second, we study their effects on the diabolic loop between sovereign risk and bank risk by extending the workhorse model in Brunnermeier et al. (2016a). Third, we describe the politically feasible steps that policymakers can take to make ESBies a reality. Can ESBies be designed to be as safe as the German bund? If so, would their supply be adequate for banks to use them as a safe store of value? We answer ‘yes’ to these questions, based on simulations of a stochastic model of default and loss-given default rates for Eurozone sovereign bonds. In a benchmark scenario, expected loss rates are calibrated to CDS spreads. In an adverse scenario, we envisage considerably higher loss rates and cross-country correlations. In the benchmark scenario, we find that ESBies with a 30% subordination level would be as safe as German bunds. If the underlying portfolio had a face value of €6tn, equivalent to 60% of GDP, ESBies would amount to €4.8tn – approximately double the current supply of euro safe assets. The remaining €1.2tn of the securitisation would comprise moderately risky European junior bonds (EJBies), which would be attractive to high-yield investors owing to their embedded leverage. Moreover, EJBies could be further securitised to cater to various investor groups. Default correlations tend to go up during crises, lowering the benefits of diversification. To test the resilience of ESBies, we consider an adverse scenario with higher default probabilities than in the benchmark scenario and greater correlations across countries. In this scenario, ESBies with a 30% subordination level continue to be as safe as German bunds. To turn off flight-to-safety capital flows, ESBies should be constructed out of all Eurozone member states. Our simulations show that this principle of inclusiveness does not conflict with a policy objective of maximising the supply of safe assets, since including even risky nation-states enlarges the pool from which safe assets can be generated. Our numerical simulations of the properties of ESBies are conservative, as they assume fixed correlation structures for sovereign defaults. However, the introduction of ESBies will affect the equilibrium of the economy – and therefore also the likelihood of default and its correlation across countries. In fact, the intended effect of ESBies is to weaken the diabolic loop between sovereign risk and bank risk. To capture this effect, we extend a model of the diabolic loop proposed in Brunnermeier et al. (2016a). In the model, sovereign debt crises can be triggered by sunspots that occur independently in each country. A sunspot reduces the market value of domestic sovereign bonds. Banks, which hold sovereign bonds, might need to be bailed out in order to continue lending to the real economy. If tax revenue turns out to be lower than expected, the bailout forces the government to default on its obligations, ultimately bringing down the banks. Banks are initially endowed with some equity, plotted on the horizontal axes of Figure 2, and a sovereign bond portfolio. Their portfolio comprises domestic bonds and some fraction of foreign bonds – the extent to which they are internationally diversified is plotted on the vertical axes in Figure 2. With cross-border holdings, there are two effects: a diversification effect such that banks are less exposed to a domestic sunspot, and a contagion effect such that banks are more exposed to a foreign sunspot. Sources: See Brunnermeier et al. (2016b). Without tranching, both effects – diversification and contagion – are present. As shown in Figure 2, diversification prevails when bank equity is sufficiently high and sovereign bond portfolios are sufficiently balanced – in this region, the diabolic loop can occur only when there is a sunspot in both the home and foreign currency. Instead, when equity is sufficiently low, contagion can set in – in this region, a sunspot in either country can induce a diabolic loop in both countries. With the introduction of tranching, diversification occurs at lower values of initial equity. The contagion region shrinks, and the safe region – in which no diabolic loop can occur – expands. The intuition for this result is that tranching shifts default risks to junior bond holders outside of the banking sector. Tranching is thus a positive sum game, as it reduces the endogenous risk of a diabolic loop. ESBies are innovative sovereign debt securities. As such, a natural concern is that they might create so many complications as to undermine their effectiveness or make them infeasible. In fact, ESBies are entirely feasible, both politically and technically. To bring them about, policymakers should take three steps. First, decide who should issue ESBies. In principle, the securitisation could be done by a public entity (such as the European Stability Mechanism, European Investment Bank or ECB) or private entities (such as primary dealers, other banks, and large asset managers) – or even both. Second, publish an ESBies handbook to define the standards to which ESBies should adhere. In particular, the handbook should define the subordination level and underlying portfolio that shall characterise ESBies. In an initial experimental phase, the volume of ESB issuance could be relatively limited, allowing technicalities to be worked out. Afterwards, policymakers could expand the market for ESBies via a centralised market mechanism, such as an auction, by which banks would swap their existing sovereign bond portfolios for a portfolio of ESBies and EJBies. The ECB could facilitate this process by accepting ESBies in its monetary policy operations. Once the market for ESBies attains a critical mass, policymakers will be able to reform the currently deficient regulatory treatment of sovereign exposures in banking regulation that facilitates the diabolic loop. This can be done, for example, by setting non-zero risk-weights for national sovereign debt. By virtue of their safety, ESBies should be exempt from such risk weights, while banks’ holdings of EJBies should be subject to a capital charge according to a ‘look-through principle’ – so that the combined capital charge of ESBies and EJBies equals that of the underlying securities. Despite their importance for the smooth functioning of financial markets, safe assets are currently inadequately and asymmetrically supplied in the Eurozone. ESBies are a solution to this quandary. They would increase the supply of safe assets and preclude distortionary flight-to-safety capital flows across countries. The availability of this union-wide safe asset would also weaken the diabolic loop between sovereigns and banks, insofar as banks are encouraged to hold such a safe asset instead of national sovereign bonds. In this sense, there is a natural complementarity between the introduction of ESBies and the reform of the prudential regulation of banks’ sovereign exposures. In sum, ESBies offer to Europe the benefits that the US enjoys from federal Treasuries – namely safety, as well as symmetric and abundant supply – without the downside of mutualisation. Brunnermeier, M, L Garicano, P Lane, M Pagano, R Reis, T Santos, D Thesmar, S Van Nieuwerburgh, and D Vayanos (2011), “European Safe Bonds”, The Euronomics Group, Summary available at VoxEU.org. Brunnermeier, M, L Garicano, P Lane, M Pagano, R Reis, T Santos, D Thesmar, S Van Nieuwerburgh, and D Vayanos (2016a), “The sovereign-bank diabolic loop and ESBies”, American Economic Review Papers and Proceedings, 106 (5), 508-512. Brunnermeier, M, S Langfield, M Pagano, R Reis, S Van Nieuwerburgh, and D Vayanos (2016b), “ESBies: Safety in the tranches”, European Systemic Risk Board Working Paper No. 21. Farhi, E, and J Tirole (2016), “Deadly embrace: Sovereign and financial balance sheets doom loops”, NBER Working Paper No. 21843. Lane, P (2013), “Capital flows in the euro area”, European Commission Economic Papers 467.